It was raining here today – a luxury when you live in arid country! We may get rain, but it comes in short spurts and ‘gullywashers’. Today, we had one of those wonderful gray, drizzly, stay-at-home, cozy-up-on-the-couch and read days. Except I didn’t cozy up and I didn’t read. I worked on catching up some paperwork and then implemented a new time management tip that I read about! Oh well, I can read later! I read or heard this tip a loooong time ago so I don’t even know who to credit or thank – so sorry. But, it is generic enough that perhaps no copyright has been infringed. I like to keep track of what I am working on right in front of me, so when I redesigned my office, I wanted space for a large bulletin board just so I could use this tip (stored away in the old noggin). That way I would be able to SEE what I am working on, but it would be somewhat organized. This time managment tip requires some sort of bulletin board or magnetic board. But I suppose you could be more creative than me and come up with ways to adapt it! I am always following a checklist or flowchart in each of my projects so I often have several pieces of paper on my workspace. I am also a list maker, so I will have lists on my desk as well. Thus, I am always looking for the right piece and forever remaking lists when I add to or complete items. This tip puts the lists in a different place – and right in front of me. 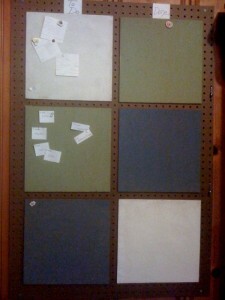 Each card was then tacked to one side of the bulletin board – on the To Do side. Then, when I am ready to work on a project, I can look at the steps necessary in a glance, take one card down at a time (or several that are similar tasks) and work on that task. This creates a bonus to the system – keeping me focused on just that task! Then when I am done, they go back up on the other side of the bulletin board – on the Done side. You might be asking why do you even put them back up? Well, a couple of reasons for that. One is psychological. Seeing the cards go over to the ‘Done’ side is satisfying! Another is that I do some of the same tasks (remember my checklists and flowcharts? ), so these might be reused for the next project. Don’t know how it will work, but I am excited to try it and will update you soon.